Alec Baldwin, playing the character Blake in his immortal opening monologue in the film version of “Glengarry Glen Ross,” tells us that sales is a tough racket. He was right, of course; sales is a tough racket, not just for the folks selling products, but also for everyone involved in the selling process—the marketing teams, the demo folks and the lead-generation people. Selling is tough. Selling is purely results-driven. It is a game where second place is failure, where mistakes are unforgiving, and success can never be taken for granted. Too many people assume sales is just a matter of finding the confident, outgoing personality types that dress well, look good and have enough knowledge to get through a conversation about the product they are charged with selling. The reality is that selling is a huge undertaking. It requires all of the stuff listed above, but it also requires technology, planning and a strategic understanding of how the product impacts a given company. It requires knowledge about how companies buy the products you offer, why they buy and what they are trying to accomplish pertaining to their goals and objectives as a company. Selling is purely results-driven. It is a game where second place is failure, where mistakes are unforgiving, and success can never be taken for granted. You can do everything right, by the book, with perfect execution and still lose the deal. For many years, companies ran their sales operations like sports teams. They gave new reps “try outs” in the form of small opportunities. If you sold, you got more opportunities and if you didn’t sell, you were fired. Today companies look at sales a bit differently. Today they know they can’t afford to waste a territory on an unproven resource. They can’t allow the sales representative to control the conversation between the selling company and the buying company. They know that selling is not so much about pushing product out the door but is more about communicating effectively the wants and needs of a buyer with the capabilities and solutions from a seller. Effective selling facilitates the sales transaction. It makes the seller easy to do business with. It also seeks to minimize the cost of selling. Like any business function or process, efficiency is what drives greater margins and lower costs. The selling process must be lean, directed and managed every bit as much as the purchasing department or the loading dock. Also, the selling process should be automated wherever possible. Effective selling requires bringing together two natural historical enemies and facilitating a real partnership between them. Sales and Marketing must be unified in purpose. Strategic programs implemented by Marketing must be translated into the tactics of the Sales operation. ERP systems have extended their reach into the sales and marketing functions to facilitate this unification. ERP and CRM are effectively joined to create automated sales and marketing functionality that’s far more beneficial than either could be by themselves. On a functional level, this translates into five separate specific activities that benefit from this unification. Complex products, highly engineered products or highly configurable products require a substantial amount of upfront discussion and qualification between buyer and seller. Much of this is linked to engineering considerations and how the product might act under certain use or stress conditions. Even proposals and RFIs that provide detailed information related to this still require consideration and thought on the selling side to assure correct application, configuration and pricing. The effect of this is many times an iterative, back-and-forth type trial and error conversation that delays the actual award or contract decision. Reducing this delay is what automating the proposal and quotation process is all about. Proposal requests come from many different sources. Some are valid and some are not. Knowing which proposals to move forward with is a tough decision-making process. There is a tendency to push to “win them all,” but as anyone can tell you, your product is not likely to be the best solution for every user. Knowing when to drop out is a great way to make sure that you have the knowledge, capability and resources available for those proposals that you do win. CPQ solution, like Cincom, places all of the expert engineering knowledge into the product configurator. 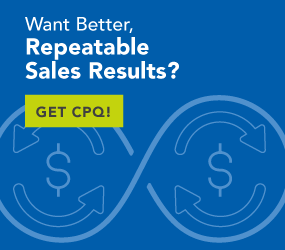 Your engineering team will still need to be available, but in most cases, the field sales team will be able to rely on the logic build into the CPQ solution to keep them from building or quoting an illegal configuration of your product. This means less time spent on upfront training of new guys on your product. This means you get your new salesperson in the field, quoting and closing faster than your competitors will even think possible. Forecasting. Everybody hates it, everybody dreads it and nobody believes it. Well, those days are gone. Now you have full visibility into your pipeline all day every day. Your forecast is always up-to-date because it is automatically derived from real-time data supplied from your CRM system. Now when you tell your budget committee you will need x dollars, they will believe you because you are nailing your forecasts every single quarter. Your sales process is really the reason you are in business. This is where your success or failure will be defined. Great product, great engineers, great ideas, great backing; they all lose their impact if you are supporting a mediocre sales team. Give your team the chance it deserves; give the tools, training and support to be the all-stars you need them to be. To learn more about how the Cincom Business Suite can help you win more business, visit Cincom Manufacturing Business Suite home page.